You can make a tile or rubber stamp from many different kinds of material, such as a potato (easy), a linoleum block (hard), or a block of wood (also hard). This tile was made from a soft, easily carved block called Speedy-cut, material similar to an eraser. Sharp carving tools were used to carve out a pattern, and water-based ink was used to make the print. The tile was rotated in the print, and printed four times, to create a pattern with rotational symmetry, similar to the magically detailed patterns found in Islamic art. 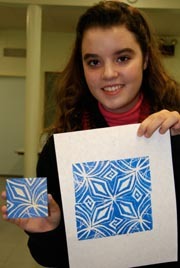 See more photos of handmade Islamic tiles made by the Class of 2007 and Class of 2011.